It’s fair to say that Karamea and Oparara Arch Track are probably the most photographed locations in New Zealand. It’s a shame that a lot of travellers don’t get to see this area. One reason is that it definitely is one of the South Island’s more remote locations. But if you have plenty of time and you want to visit here, you won’t regret it. Be prepared for the most awesome and untouched beauty. In fact, this sort of nature is very typical of the West Coast Region. And it has a spirit that will definitely move you! For this reason, relatively few travellers head this far up the coast unless they are planning to do the Heaphy Track. Otherwise, you have to spend 90 minutes driving back on yourself to pick up State Highway 6 again at Westport. Facilities up here are also very limited in terms of supermarkets and garages. This isn’t very efficient for island-wide road trips, so most give it a miss and don’t go further than Punakaiki to see the famous pancake rocks. 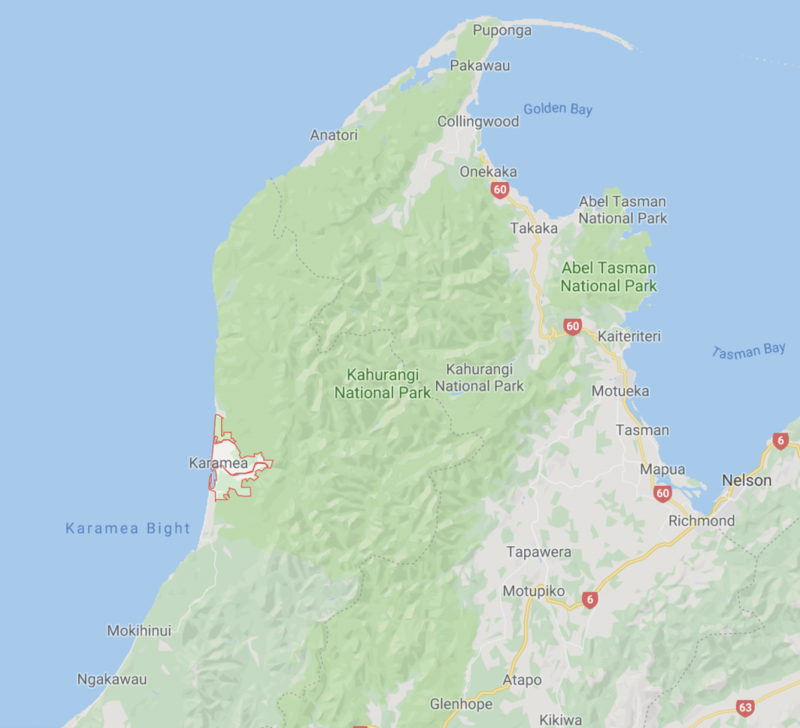 The result is that Karamea and northern half of the West Coast is some of the least touristy parts of the entire country. It’s quite remarkable, considering the incredible gems that this region offers. 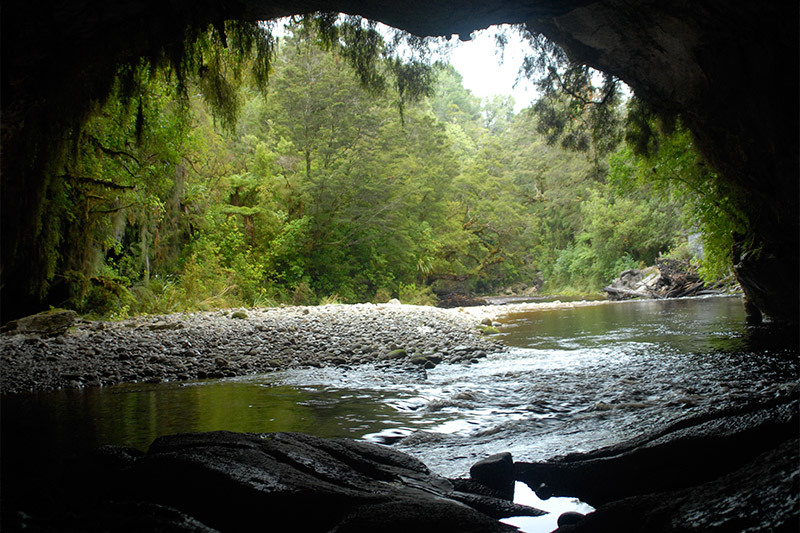 You have miles of white sandy beaches and untouched rainforest, and of course, the world-famous Oparara Arches! The West Coast has a pretty unique climate compared with the rest of the South Island that often takes travellers by surprise. Being on the Western side of the Southern Alps, the coast bears the brunt of the prevailing northwesterly winds. This means it gets extremely high rainfall, with over 100 inches on average each year. We travelled here in the winter month of July and it was pretty cold. But with plenty of wool clothing, we were well-prepared. A lot of people don’t know this, the winter months are some of the best to visit. The West Coast has beautiful sunny weather from late May to August, especially in Karamea, where the climate is a bit more like Abel Tasman. The summer months will be warmer but a lot wetter, and the region will be at its busiest because it’s peak season. So, the winter really is one of the best times to plan a trip! 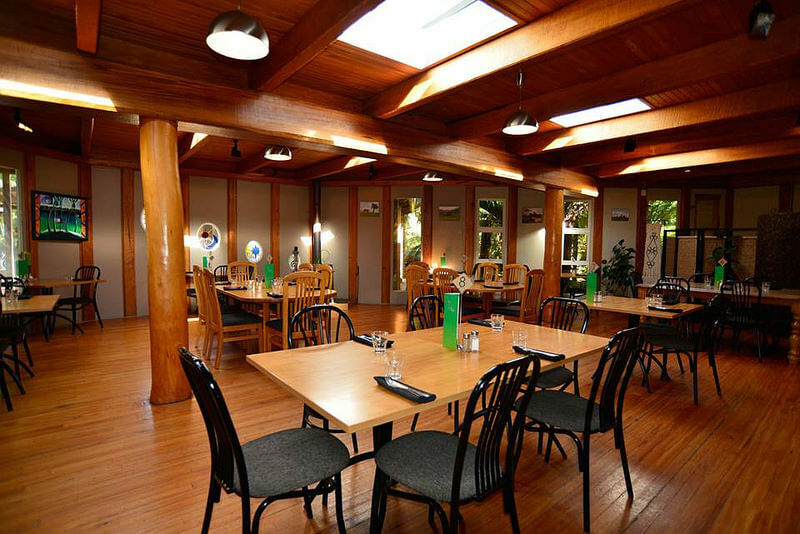 There is one restaurant in Karamea and its a bit of an all-rounder. We received the friendliest welcome at the Last Resort. A fantastic name, because it truly is the last place to fuel up before the Heaphy track. My chicken curry and Michael’s pasta was delish! What you’ll find, is that the restaurant is just one part of an accommodation complex. At The Last Resort has a variety of accommodation options – these include cottages, studios and lodge suites. The staff in these more remote places are often very friendly. They deliver the type of service that’s not pretentious, but truly sincere. You may be surprised to discover that in a short stay you can fit in quite a lot of sightseeing. 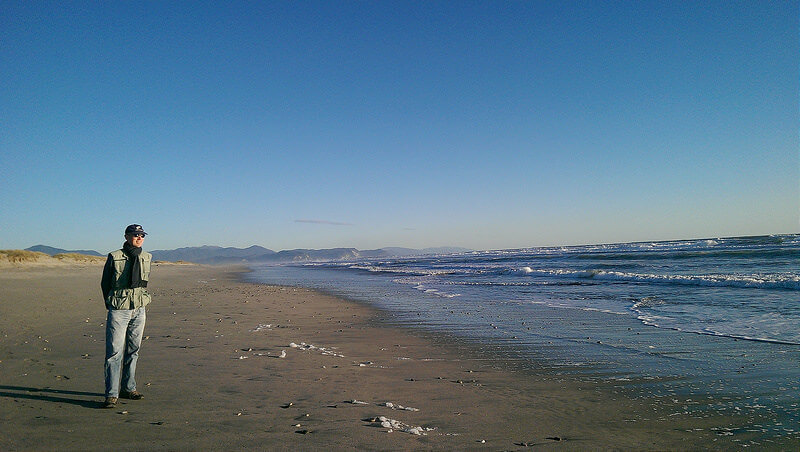 Our explore began with a stunning late afternoon walk on a beautiful beach. Can you imagine the sense of freedom of having this beach all to yourself!? Believe me, there are very few places in the world these days where you’ll get that sort of luxury. These beaches are rugged as they are beautiful. The next morning of our stay, we awoke to a very dry frost. You could have cut glass with it! But the winter sun is enough to warm you through. For the more remote parts of New Zealand, it always pays to have a 4 wheel drive because many of the roads are unpaved. 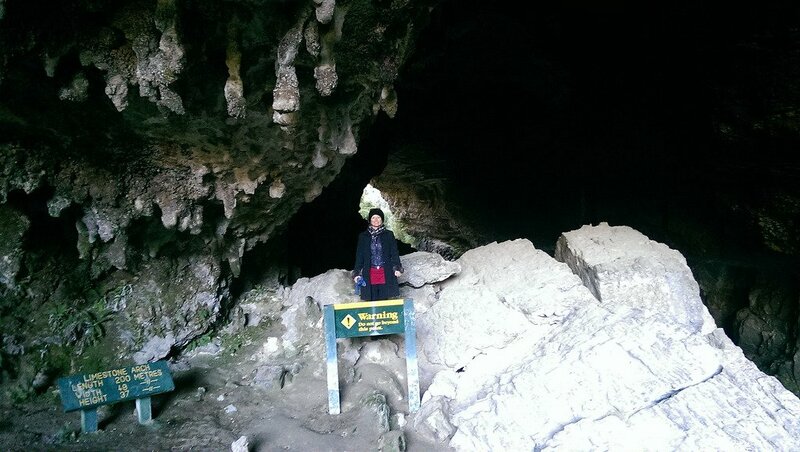 To reach the Oparara Arches, you’ll need to take an unpaved road which is 10km from the Karamea settlement. The road is a little hairy; its 14km of hairpin bends which is only wide enough for one car. You’ll see multiple signs along the road saying it’s not suitable for campervans – it’s not hard to see why! The plus side is the people are very careful and drive slowly for this reason. There is just enough room to pull over to let someone past, so as long as you take your time you will be fine. The road ends at the Oparara Arch Track carpark. 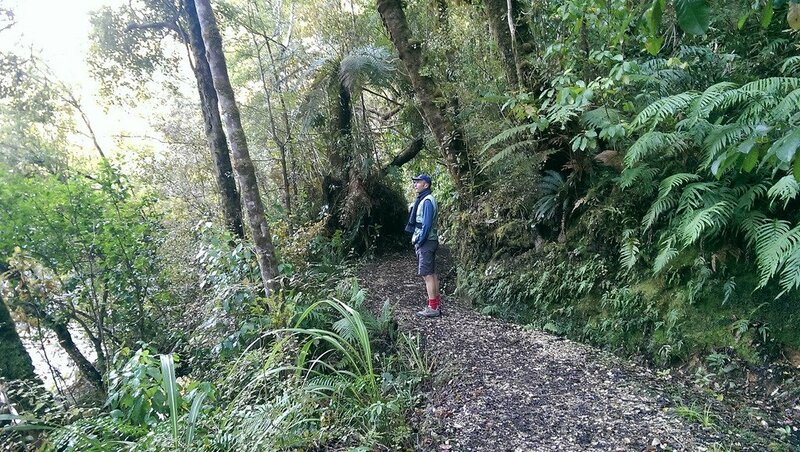 As you walk down the Oparara Arch Track, you’ll become aware of the delicious air that crackles around you. In the winter months, everything seems frozen in time. But you’ll still be blown away by the lush, native bush that thrives here. There is one tremendous advantage to visiting this spot in the colder months. 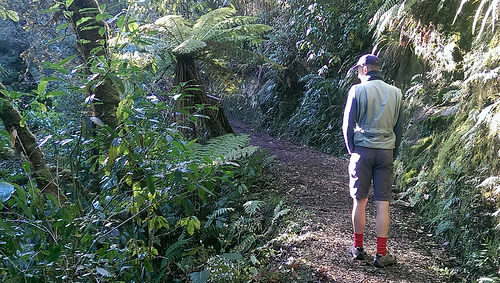 There are absolutely NO sandflies on the Oparara Arches Track – they don’t like the cold. Another reason for the absence of sandflies is that ‘black’ water is found around these parts. This is a type of water that mosquitoes will NOT breed in. So no matter what time of year to visit Karamea, you won’t find any of those annoying critters! 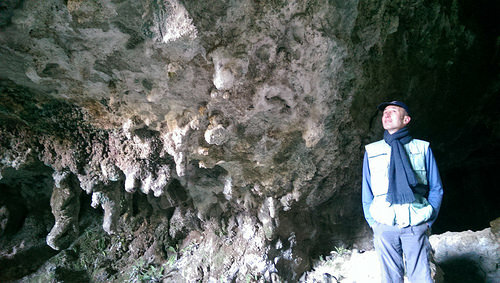 Another reason to visit the Oparara Arches is the rock forms. They have a wonderful texture and shape to them. This photo doesn’t really do it justice. If you look right at the end, there is an opening framed by the rocks of the cave. So many photographers have spent their time capturing this stunning scene. It’s just like looking through a framed window to the world beyond. 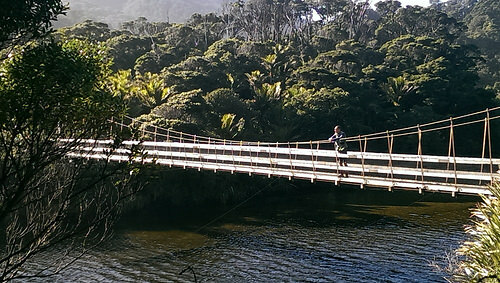 The Heaphy Track is one of New Zealand’s nine ‘Great Walks’. These are given special recognition owing to their stunning beauty. The Heaphy is one of the longest at 78.4km, and takes 4-5 days in total, from Karamea up to Golden Bay through Kahurangi National Park. Sometimes, you come across travellers who have just completed the Heaphy Track cycling. They always look scruffy and exhausted! But there’s no mistaking their exhilaration and joy after completing this beautiful experience. The sun has begun to warm our backs, so let’s say goodbye for now and leave Michael to enjoy his moment of bliss! After Karamea and the Oparara Arches, we will be travelling further south to Fox and Franz Josef Glacier or further to Wanaka, so stay tuned! 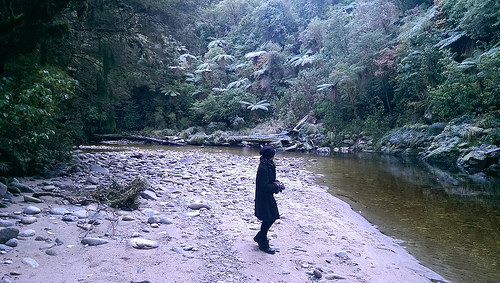 Karamea and the Oparara Arches should definitely be on your itinerary if time permits it! 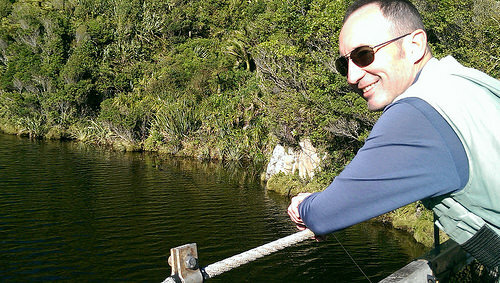 We guarantee that you won’t regret it – it’s a remarkable part of New Zealand without equal. We rely a lot on the local knowledge of people like yourself – invaluable when you’re looking for the hidden places. (Believe me, Michael soon regretted the decision with the shorts). Hope we can make this track when we are in the vicinity in Jan2015. I enjoyed your blog. I love nature and beautiful places to photograph. Hey Siva, good to hear you’re on your way to one of the most beautiful places in New Zealand. 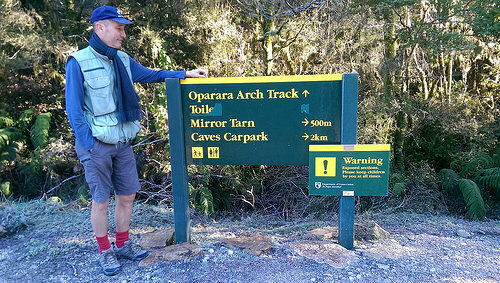 Karamea and the Oparara Arch Track is a little off the beaten track. Having a 4-wheel drive vehicle is definitely recommended, otherwise you may opt to join a guided tour. Happy travelling.